The 18 hole Championship Golf Course of Antognolla, designed by the famous course architect Robert Trent Jones jr. is just a 20min drive away. 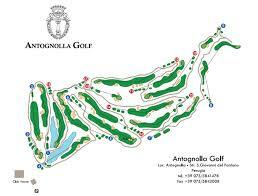 The course is dominated by the medieval castle of Antognolla and is an unrivaled experience for both the professional and amateur golfer alike. Beautiful area, far reaching views, natural flora and the spectacular medieval and typical Umbrian architecture both inside and around the golf course. The Golf Club Perugia is only 6 km far from the old town centre of Perugia. The course is gently undulating parkland – par 71 -, partly dating from the late nineteenfifties. There is an excellent practice ground with open and cover bays, two chipping greens and a practice putting green. There are also three separate par 3 executive holes. The club house was, in times past (1921), a limekiln; the two imperious towers still rise over the course.- Inside the Club House there is a restaurant open for lunches and dinner, where you can taste the traditional umbrian cuisine.